German spy, Josef Jakobs was laid to rest in St. Mary's Roman Catholic cemetery at Kensal Green on 18 August, 1941. His funeral service was carried out by Rev. Charles Bernard Flood. Charles was the son of Ellen Mildred Bishop and Arthur Frederick Flood. Ellen was the daughter of a river pilot (William Bishop) and Arthur was a Chartered Accountant's clerk. Charles was their first child and was born 4 September, 1900 in St. Pancras. Two years later, Catherine Edith Mary Flood was born to the young couple. Charles studied at St. Ignatius College in Stamford Hill and may have brushed shoulders with some of the older boys, including Alfred Hitchcock. With the outbreak of war, Charles joined up as soon as he was able. Despite the official age limit of 18, many younger boys were accepted into the ranks, as long as they met the height (5'3") and chest measurement (34") requirements. After serving in World War I, Charles joined the consular service for a few years and then decided to become a Catholic priest. Charles studied at St. Edmund's College and the University of Fribourg before being ordained in 1926. 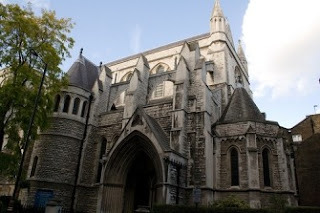 In 1941, Charles was serving at St. James Roman Catholic Church (Spanish Place) in London. On 9 August, 1941, Charles presided at the funeral of six month old Mary Bridget O'Sullivan who was buried at St. Mary's R.C. Cemetery. Less than 10 days later, he would be called upon to preside at the funeral service of Josef Jakobs. Ten years later, he was made a Canon of the Westminster Chapter. He was also appointed administrator of the Crusade of Rescue, an organization to assist orphaned and destitute children. Charles received quite a bit of recognition for his work with orphaned children. In 1961, Pope John XXIII was made a Domestic Prelate (Monsignor). A couple of years later, in January 1963, Charles was recognized by Queen Elizabeth and appointed to the Order of the British Empire. Charles passed away on 17 December, 1963 at the age of 63. Obituary for Charles B. Flood - The Tablet, 28 December, 1963. Seafaring Bishops by Norman A. Bishop - contains a bit of info about Charles B. Flood and his maternal lineage.